This Keystone one-reeler features two of the company’s strongest talents in the wake of the then-still-recent departure of Charlie Chaplin for Essanay. Despite Keystone’s reputation for slapstick, much of the humor here is situational in nature, and even the cops seem subdued, compared to earlier outings. As the movie opens, Mabel Normand is hard at work over a wash basin, while her husband (Harry McCoy) sleeps in. She decides to go wake him and ask for some help with the washing up, but he demurs, so she tosses a basin of hot water on him. 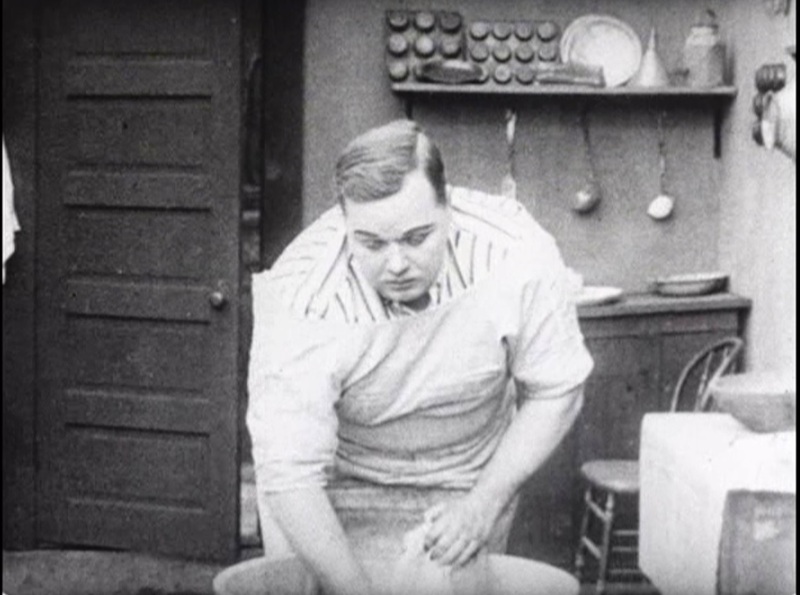 Meanwhile, he neighbor Roscoe Arbuckle is toiling across the wall similarly, to the constant nagging of his older wife (Alice Davenport, who I thought at first was meant to be his mother). The two apartments share a clothes line, and Mabel and Fatty meet in the process of hanging up some of their respective laundries and confusing some embarrassing items of clothing. Fatty offers to use his hand-cranked drying machine on some of Mabel’s clothes, and the two seem to be hitting it off, until her jealous husband spots Fatty “accidentally” catching a fold of the dress she’s wearing in the machine! Despite his much larger size, Fatty backs down immediately in front of his opponent’s wrath, and then gets nagged again by Alice. Action now shifts to a park, where the two couples are each taking a walk. McCoy settles down to read his newspaper and refuses to share it with Mabel, who gets mad and leaves him, while Fatty is forced to read to Alice until she dozes off on another bench and Fatty leaves her alone as well. The two likeable characters meet again and decide to go for a drink together, Fatty grabbing his wife’s purse to he can be a gentleman and pay. The missing purse causes confusion when McCoy and Alice meet, and she accuses him of stealing it, bringing two policemen into the case. McCoy finds Mabel and Fatty, but at this point confusion over whose purse is whose and who was cheating on whom gets lost in a fray of chaos. Both women wind up dragging their respective men home by the ear. 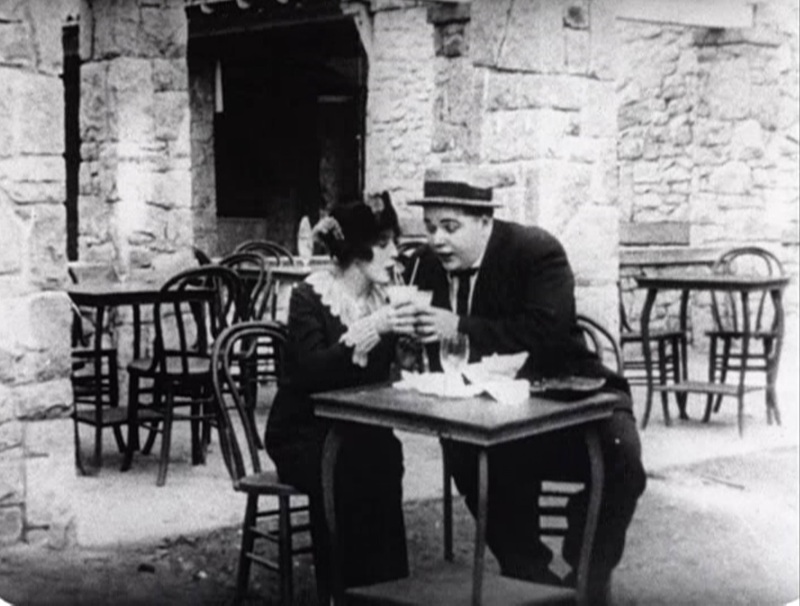 I was a bit confused at the beginning of the movie, because I assumed that Arbuckle would be Mabel’s sleeping husband. The title seems to imply that they would be together, and they were a couple in a number of other Keystone comedies. When he was introduced, I was relieved to see that I hadn’t forgotten what he looks like. This movie wasn’t quite a laugh-riot for me, and I was surprised by its low-key approach. It does end with a fairly classic Keystone chase (a short one) and it has some physical gags in it, but a lot of the comedy depends on gender stereotypes and the audience’s recognizing the situation. In that sense, it’s also less violent than a lot of Keystones, and less fast moving. Perhaps it can be seen as a good breather for anyone doing a Keystone marathon.